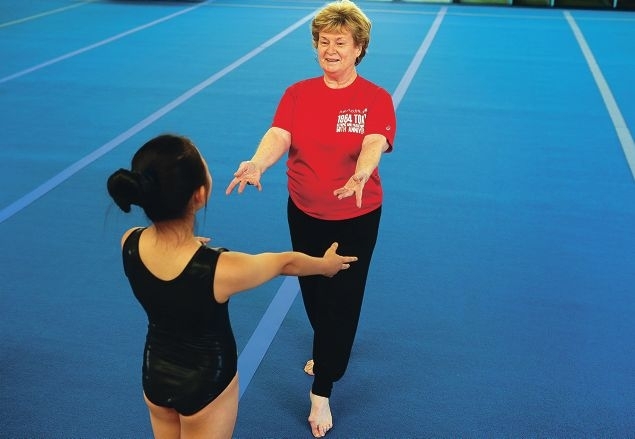 Val Norris-Buffham works with gymnast Erina Hong. IT was always going to be hard for Val Norris-Buffham and husband Ken Norris to leave the Jandakot academy they built together, considering the effort they put into making it successful. In late 2014, Mrs Norris-Buffham, a dual Olympian, promised a trip to Singapore for the Prime Gymnastics International Invitational was to be her last overseas trip as head coach of Olympic Fun and Fitness. In her words she was passing the baton and easing off from a role she had held for four decades. Fast forward two years and the pair was finally able to take that well-earned break when their son Damien Norris, a Melbourne-based lawyer and former national champion gymnast, decided it was time to come home and lead the business at the end of last year. It was a great result, with the Murdoch couple having considered closing it down. “It blew us away. We were very pleased,” Mrs Norris-Buffham said. “I said to him I now know how top athletes feel when they drop out. Things change quickly. “But it got to the stage where the updates were needed. Mrs Norris-Buffham, who competed at the Tokyo Olympics in 1964 and the Mexico Games four years later, said she hadn’t stepped back into the academy since handing over the reins. Son Damien said a lot of the changes were cosmetic, with a move to automated systems and a bigger online presence. The academy has also introduced its “Wilding Project”, a move into parkour, free running and natural movement. Damien said there had been a shift from gyms with dumbbells and weights to gyms that focus more on expanded body movement. For more information, visit www.olympicfunfitness.com.au.